Jan 10, 2018 - The body hair stigma has been an on-going battle for women. The disgust which most people have for body hair has been a debated issue from quite some time. However, now just like men have "Movember," wherein men grow their facial hair to raise awareness for men’s health issues like prostate cancer, the ladies have "Januhairy," which celebrates body hair and women skip shaving their body hair. Started by Laura Jackson who is a drama student at the University of Exeter in the U.K., began the movement. 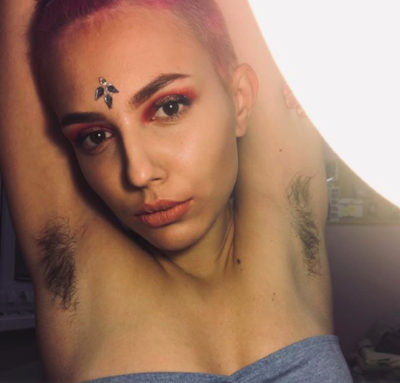 The movement aims to make people comfortable about their body hair. She posted a picture on her Instagram with a long post where he mentioned that the body hair for a performance as part of my drama degree and after that she began to like it that way. She said, "After a few weeks of getting used to it, I started to like my natural hair," She posted on the Instagram account that she made for the campaign called @janu_hairy, "I also started to like the lack of uncomfortable episodes of shaving. Though I felt liberated and more confident in myself, some people around me didn’t understand why I didn’t shave/didn’t agree with it. I realised that there is still so much more for us to do to be able to accept one another fully and truly." She concluded with, "This picture was taken a few months ago. Now I am joining in with Januhairy, starting the growing process again along with the other wonderful women who have signed up! Progress pictures/descriptions from our gals will be posted throughout the month. Lets get hairy." Here are some other women who joined the campaign Januhairy with the pictures of their body hair. Body hair deserves all the love in the world and awareness about it on social media is absolutely important. However, the offline world still largely unaware of how important it is to stop hating your own body hair. While we also believe that it is an individual’s choice to hae body hair or get rid of it, but hating body hair or getting disgusted by it shouldn’t be an option.